The Mon-Yough region offers a variety of attractions from a nearby PGA champion tour golf course, theme parks, historical sites, waterslides, to luxurious day spas, outdoor recreation areas, acres of hiking trails, water-sports and miles of bike trails. Whatever your pleasure, you are sure to find an attraction perfectly suited just for you. Kennywood is one of the oldest and most beloved amusement parks in America. Founded in 1898, Kennywood has thrilled and delighted both young and young-at-heart visitors for more than 110 years. From the early days of the carousel, through the development of the first roller coasters, to the technological advancements in today's steel looping coasters, Kennywood has always been the park that puts a smile on everyone's face. Designated a National Historic Landmark since 1987, you'll find "Lost Kennywood," a replica of turn-of-the-century architecture that houses some of the park's most popular rides, as well as attractions that go from mild to wild throughout the park. Refuel at more than a dozen dining options offering tasty treats that can't be found at any other amusement park anywhere. Kennywood is a unique experience and remains one of "America's Finest Traditional Amusement Parks." In fact, it's what memories are made of! The most frequently heard expression of first-time visitors to Sandcastle is: "Wow! I don't believe I'm still in the city." Usually, they've just arrived on the boardwalk and are looking toward the Monongahela River. The scene is one of unusual beauty and tranquility – a resort type setting along a calm waterway, with a green wooded hillside providing the backdrop. Rides and Attractions - Sandcastle is set along the Monongahela River and offers 15 waterslide attractions, the Mon Tsunami Wave Pool, scenic Mushroom Pool, the relaxing lazy river, and two children’s area – all located on a boardwalk that is sure to make you feel like you are on vacation. For thrill seekers and mild riders, there are plenty of tube slides and body slides for your liking! Food - When you're ready to take a break from relaxing and tubing, Sandcastle offers dining options for every appetite and diet. From small bites, casual dining, and sweets and treats, you'll find something for the whole family. Birthday PartiesDo you have a summer birthday coming up? Start your planning and host the best party yet at Sandcastle! Our Sandcastle staff takes care of the details and planning to help you enjoy the perfect birthday party, stress-free! Group events also available. TicketsThere is no doubt that Sandcastle is one of the best places to go in Pennsylvania for water park fun! Check out our discounts and start planning your next Sandcastle trip. Tickets and Season Passes available online. Buy now! Spend a morning or afternoon kayaking down the river and bicycling with your family. Start out at Peddler's Village and bike to Buena Vista. Then, Ted's will deliver the canoes or kayaks for you to float back in and return your bikes to Peddler's Village or simply be shuttled. This well maintained trail is a link in the Great Allegheny Passage, which provides the road less traveled between Pittsburgh and Washington, DC. The trail’s gentle grade, isolated from motorized traffic, offers people of all ages and levels of physical ability a place where they can safely walk, jog, bicycle, cross country ski, or even ride horses. Marvel at the spectacular natural beauty of the historic and often remote Youghiogheny River as it winds it’s way through the hills of western Pennsylvania. Conveniently located along the trail are bike shops, bed and breakfasts, bike and canoe rentals, bait shops, boat ramps, eateries, picnic areas, water facilities, restrooms, and campgrounds. The MYTC visitor center at the Boston Trailhead is open most weekends during the summer months and provides information about the trail and local services, as well as trail merchandise for sale. Primary access is the trailhead located in Boston, Elizabeth Township; hence the nickname ‘The Boston Trail’. Other trailheads are located at Buena Vista and Sutersville, also in Elizabeth Township. The Waterfront is home to over 70 shops, restaurants, and entertainment venues. Our unique open-air shopping environment and beautiful landscaping provides an upscale shopping experience like no other. 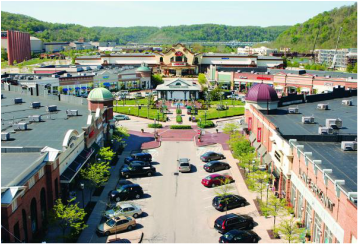 The Waterfront is a super-regional open air shopping mall spanning the three boroughs of Homestead, West Homestead, and Munhall near Pittsburgh. The shopping mall sits on land once occupied by U.S. Steel's Homestead Steel Works plant, which closed in 1987. It has a gross leasable area of 700,000 square feet (65,000 m2) in "The Waterfront" and 400,000 square feet (37,000 m2) in "The Town Center." The development officially opened in 1999. More development continued into the early 21st century. Renzie Park now encompasses 258 acres, including the Lions Band Shell, a fitness trail, an enclosed pavilion/exhibit center, the McKeesport Heritage Center museum and archives, picnic facilities, and Pennsylvania’s second-largest certified rose arboretum. 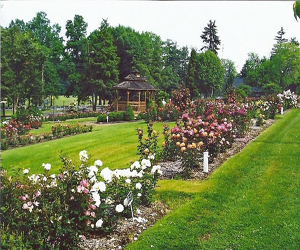 The park is maintained by volunteers, and McKeesport’s Rose Garden and Arboretum contains some 1,200 rose bushes in 28 beds, plus 300 miniature rose bushes. Renzie Park plays host to the International Village, a three-day celebration of our shared traditions and heritage, including food, music, dancing, traditional clothing and crafts. Looking for something different on over the weekend? Check out the McKeesport Little Theatre. The McKeesport Little Theater (MLT) has a determination and vision to provide live theater to the residents of McKeesport and the Western Pennsylvania area. The MLT provides an opportunity for community actors to hone their talents before a live audience. With more than 5,000 patrons each year, the MLT consists of numerous performers, both young and old. 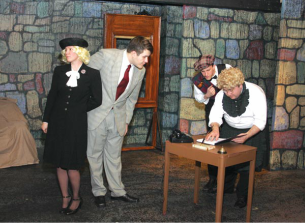 After more than 50 years, this group is still a viable and important institution in the society of the Mon-Valley and with the support of its patrons and members, the McKeesport Little Theater will continue to be so for many years to come. Pittsburghers Rooting for the Eagles in Hays? It has probably been more than 250 years since Bald Eagles last nested along Pittsburgh’s three rivers. As recently as the mid-1980s, there were just a few remaining nesting Bald Eagle pairs anywhere in Pennsylvania, all of these in the northwest corner of the state. This history makes it all the more amazing that today there is a pair nesting on each of our three rivers, and one, located on the Monongahela River in the community of Hays, is within just five miles of the Point! A second nest is within view of the Allegheny River near Harmarville, and a third nest is in an undisclosed location in Allegheny County along the Ohio River. Built in 1907, the Carrie Furnaces produced iron for the Homestead Works from 1907 to 1978. During the 1920s, 1930s, and 1940s, Carrie 6 and 7 consumed approximately four tons of raw materials comprised of iron ore, coke, and limestone for every ton of iron produced. 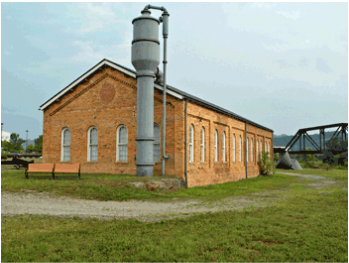 The cooling system for the blast furnace required over five million gallons of water a day. These furnaces reached their peak production in the 1950s and 1960s when they were producing 1000 -1250 tons of iron a day. 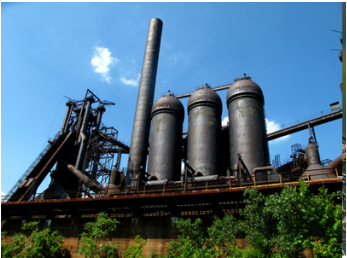 For the proposed Homestead Works National Park, Carrie Furnaces 6 and 7 will undergo a $78 million stabilization and renovation that would allow visitors to climb a series of walkways around these industrial giants and see the furnaces that set world records in the production of iron. In the early morning hours of July 6, 1892, at the Pump House of the Carnegie Steel Company's Homestead Works, thousands of workers, their families and supporters, armed with sticks, rocks, and guns rushed to meet two barges coming up the Monongahela River. The barges carried 300 Pinkerton guards who had been sent to protect the works during the Homestead Strike and Lockout. After a bitter day of conflict that left seven strikers and three Pinkerton men dead and dozens of others wounded, the guards surrendered. They were then forced to "run a bloody gauntlet" while being lead to a temporary jail at the Homestead Opera House until they were sent out of town by rail the next morning. The Monongahela River was voted 2013 PA “River of the Year!” The Monongahela River (128m; 206k), known as the "Mon," begins at the West Fork and Tygart rivers in Fairmont, West Virginia. It flows through West Virginia into Western Pennsylvania then meets the Allegheny River at Pittsburgh to form the Ohio. Native Americans named the river Monongahela, which means river with crumbling or falling banks. It has the distinction of being one of the few rivers in the United States that runs north. Boat building was the first industry on the Mon and as such created the vessel that Lewis & Clark used to explore the territory. At the height of steel production in Pittsburgh, 58 mills operated along the Monongahela River. The Youghiogheny River rises in northern West Virginia, in Preston County southeast of the town of Kingwood and near Backbone Mountain. The headwaters are approximately 10 miles (16 km) north of the headwaters of the North Branch of the Potomac River. It flows northnortheast into Garrett County, Maryland, flowing north past Oakland and roughly parallel to the West Virginia border, separated by approximately 3 miles (5 km). 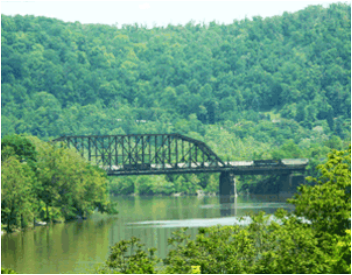 The river enters southwestern Pennsylvania on the border between Fayette and Somerset counties. It flows northwest through a gap in Chestnut Ridge and then past Connellsville. It joins the Monongahela River from the southeast at McKeesport, southeast of Pittsburgh. McKeesport is a city in Allegheny County in the U.S. commonwealth of Pennsylvania; it is situated at the confluence of the Monongahela and Youghiogheny rivers and is part of the Pittsburgh Metro Area. The population was 19,731 at the 2010 census. It is the second-largest city (not including townships, boroughs, and Home Rule Municipalities) in Allegheny county after Pittsburgh. Settled in 1795 and named in honor of John McKee, its founder, McKeesport remained a village until 1830 when coal mining began in the region where large deposits of bituminous coal existed.